Do you give up easily when faced with difficulties and pressures? Are you having a hard time focusing your efforts on your goals? Do you wait for things to happen, instead of taking action? Do you feel down most of the time because of consistent failures or setbacks in your life? Are your pursuits in life causing frustration because they are not being fulfilled? Do you procrastinate and end up doing nothing because your drive and motivation have been zapped by failure to achieve your goals? If you answered "yes" to one or more of the questions above, then it’s possibly because you've not attained the success and happiness you’re seeking in your life – and that’s probably at least partly due to a failure to achieve the goals you have set for yourself. You might be unhappy because you don’t know (or remember) what it's like to experience the great feeling you get when you achieve what you want in life. Many people are so discouraged and confused that they don't know what, where, when, or how to start achieving their goals and fulfill their life’s dreams. So What's Hindering You From Achieving Your Goals? Your excuses could include: not having enough time, not having the right talents or abilities, having too much to think about, fear of failure, or even being afraid of displeasing other people. Probably the biggest excuse is that you don't know how to set goals right from the start. That’s what was addressed in Part 1 of Happiness…and Goal Setting. In Part 1, the first message was that, before setting a goal, you must know your Definition of Happiness (which is what would truly make you happy in life). Then, once you know that, you must develop the proper mindset to achieve what you want and need. So, the question is, "how do you go about achieving all your goals?" Well, by first knowing what would make you happiest in life (your Definition of Happiness), then having the right thoughts and the proper attitude, and then aligning your Definition and attitude with the direction of your goals, you will have laid the foundation to eliminate all obstacles that come your way and have the opportunity to achieve all your goals in spite of the challenges you face. Even with all this, you will likely only realize your goals if you are bold enough to come out of your comfort zone and maintain a laser-like focus and constant commitment, despite some people telling you that you can never attain them. Finally, a book has been written to help you realize your goals and achieve your dreams, no matter how far-fetched they may seem. Goal Realization Made Easy: Your Guidebook to Lasting Happiness will help you focus on clear goals and will teach you how to actualize them by using the proper mindset and behavior. It will steadily steer you in the right direction so that you can attain the results you really want. This ebook normally sells for $27, but for right now, you can download it immediately for just $2.75!! ...and begin achieving all your goals today! 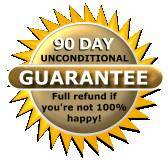 100% no-questions-asked money back guarantee. Aligning Your Goals (and Your Life) with your Definition of Happiness. So, first, click here to get all the details associated with those goal-achievement steps listed above. This will explain the process toward the achievement of your goals. The key to all this is “the process” required for the achievement of your goals. If you follow the process, you will realize your goals, regardless of how lofty they may seem. Goal achievement is a combination of many things. As described here, it is a process which requires thought (including introspection) and commitment. It is an art and a science. It is both “simple” and “difficult” (which I know doesn’t make perfect sense, but is reality). So learn more about it. Understand what you need in your life to make you truly happy (in other words, know your Definition of Happiness). Make a commitment to the process. All successful, wealthy, and happy people have goals, and they know how to reach them. Wouldn't it be great if you can actually acquire their attitudes and be on the right track to success too? This easy-to-understand report will shatter your limiting beliefs and will give you more direction toward the achievement of your goals. It will make you realize how beautiful life can be as you find yourself enjoying everything that you do. Thus, the reality of true happiness is just a few flips of the pages away. The right way to make sure you attain your goal to happiness. How to tap your hidden potentials to achieve your goal. When the best time is to start setting your goal. How lessons in History aid you to achieve your goal. How to handle and overcome obstacles. Logical answers to simple persistently asked questions. The guiding principles to get your goal on the go. Why your thoughts are the most powerful tools to goal realization. Why you have to take risk and what kind of risk is worth taking. Situations that can change the way you think; from ho-hum thinking to get-it-moving thoughts. Simple meaningful tips to activate your thoughts and turning them into reality. Things that can affect the outcome of your targeted goal. Things you can control and use to your advantage in pursuit of your goal. How to mold your thoughts geared towards goal realization. The key factors to accelerate or propel the advancement of your goal. About attitudes of different achievers and what it takes to be considered a real one. Simple, inexpensive, non-strenuous, effective, valuable, and tested tips to good health. Why aging can satisfy your heart’s desire to goal realization. A step-by-step plan to make sure you realize your goal. 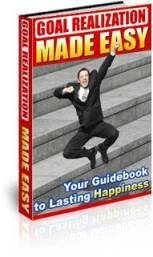 Goal Realization Made Easy will motivate you to pursue your goals that ultimately lead to happiness. The priceless lessons you will learn from this ebook have motivated countless people to become achievers, even when their aspirations seemed hopeless to attain. It will open your mind and heart’s desire into a new life – a life filled with meaning, happiness, and fulfillment. Order your copy of Goal Realization Made Easy right now and be a goal achiever for life. It’s easier than you think…once you know the right steps to take. This ebook has sold thousands of copies for $27 but I got a special deal on it and you can download your own copy of Goal Realization Made Easy right now for only $2.75! For a limited time, you can get Goal Realization Made Easy for only $2.75! If for any reason you are not satisfied with the techniques and lessons this book teaches, please contact us within 90 days and we’ll refund all your money immediately - no questions asked. One very significant factor that distinguishes successful people from failures is that they have specific goals and they reach those goals with the proper mindset and attitude. This book will show you exactly how! So act now, achieve your goals, realize your dreams and be HAPPY for the rest of your life. Get it now for just $2.75. It is totally risk free.